Halloween was a big success for the boys as I took them around the neighborhood for a short but fruitful candy hunt. 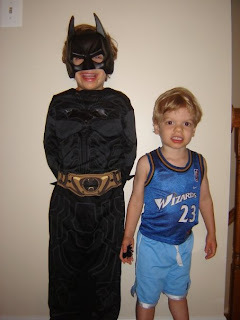 Josh kept wavering over the past few weeks on whether he wanted to be Batman or Robin for Halloween. 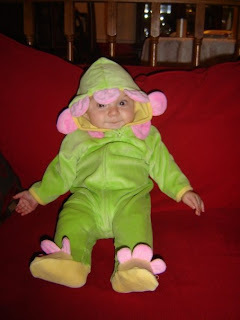 Thankfully he settled on Batman and Lori found a costume for him. It was a little big for him and the cape was a tad long but overall it did the trick. I tried to get him to talk like Christian Bale does in The Dark Knight but he was having none of that. Alex is very particular about what he wears (he has already shunned the new red Crocs that Lori bought him). Because of this we didn't get a costume for him in advance. As the witching hour approached on Saturday night, we told him he had to dress up to go trick or treating with Josh. Lori suggested that he go as a Redskin (that may be the scariest costume of all this season), but Alex replied "I want to be a Baxketball playor." So Lori dug out the old Michael Jordan Wizards kids jersey and some basketball shorts. It barely fit Alex but he looked the part and "Wizards" does have some Halloween connotations. The three of us set out to some nearby houses. At first there was a slight drizzle but the kids didn't seem to mind. This was Alex's first trick or treating effort and I had to give him a quick crash course on what to do. He initially wanted me to come up with him and hold his hand. But he quickly got the hang of it on his own and actually enjoyed saying "Trick or Treat!" The only assistance I had to provide was to hold his bag between houses. Dad: "It's ketchup Alex, you eat it all the time"
Alex: "What does it do?" What Dad wanted to say: "It manages several high yield mutual funds." Josh of course had a great time getting candy as well even if his Bat Cape got soaked. The two of them had quite a haul for only being out on the street for 20 minutes. Of course the majority of their candy will be consumed by me but we did let them eat a few choice pieces Saturday night (and will distribute more for special treats). Josh even tried a box of red hots and claimed that he liked them even though they were spicy. The success of the night made up for the disaster that was pumpkin carving during the day. I brought home a pumpkin and carving tools from work (left over from our Oktoberween party). Josh and I tried to carve a particularly intricate design (similar to this) but I botched the ghost's hands and eventually punched the entire design through accidentally while trying to carve the eyes and mouth. We were left with a big circle and I decided to trash the evidence before Lori got home. I'll stick to designing on computers. Bonus shot of Ms. Rebecca as a flower! So cute.